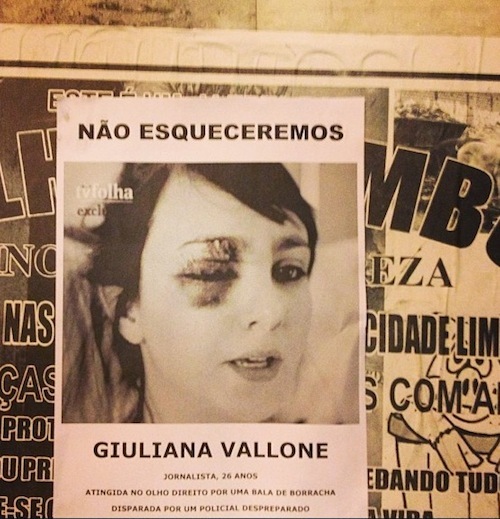 On June 13, Brazilian military police shot journalist Giuliana Vallone in the eye with a rubber bullet. That night police violently repressed a street protest in São Paulo, Brazil where thousands had gone to demand the reversal of a recent 7% bus fare increase. Local media and organizations like Amnesty International denounced the police’s “excessive use of force,” including its indiscriminate use of tear gas and rubber bullets. 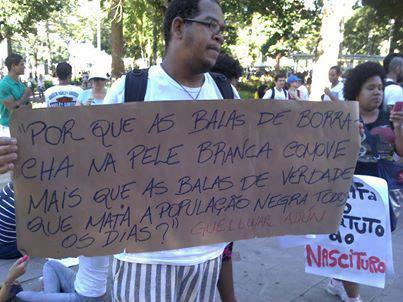 News of the police repression in São Paulo sparked indignation across the country. This photo of Vallone went viral. Within the week, mass mobilizations spread across Brazil reaching numbers unprecedented in its recent history. On June 20, more than a million protesters demonstrated in the streets. As the movement grew, protesters called for an end to political and financial corruption and – instead of the 2014 World Cup – better healthcare, better education, and affordable (if not free) public transit. Yet the degree of indignation the earlier image of Vallone caused, and the photo’s subsequent place as a rallying cry in the movement as posters emerged stating “we will not forget,” warrants particular attention. Vallone, as a young white Brazilian woman, came to serve as a somatic representative of the national body politic. An attack on her “innocent” body was seen as an attack on all Brazilians. As both the movement and the corresponding police repression continued to grow, photos of violence enacted on white female bodies also continued to go viral. While the photo of Vallone played a unique role in sparking increased indignation and mobilizations, later photos of white female victims were similarly privileged. 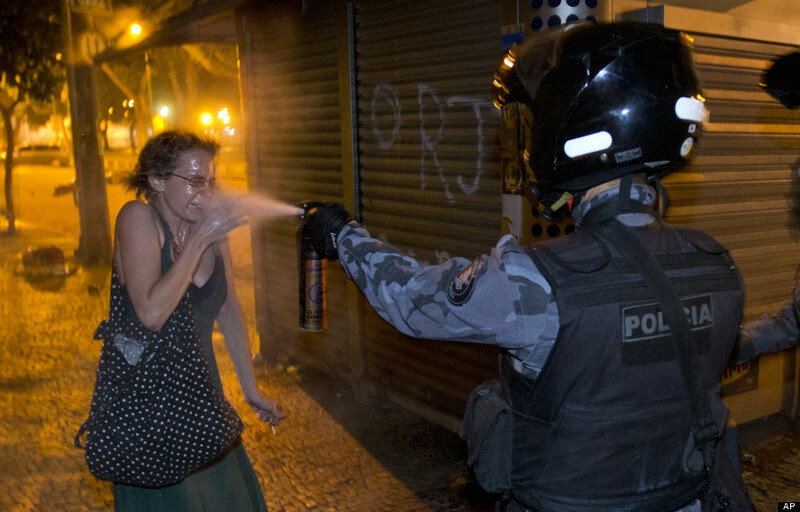 Other examples of this trend can be seen in this image, where a white woman is being pepper sprayed by the police. 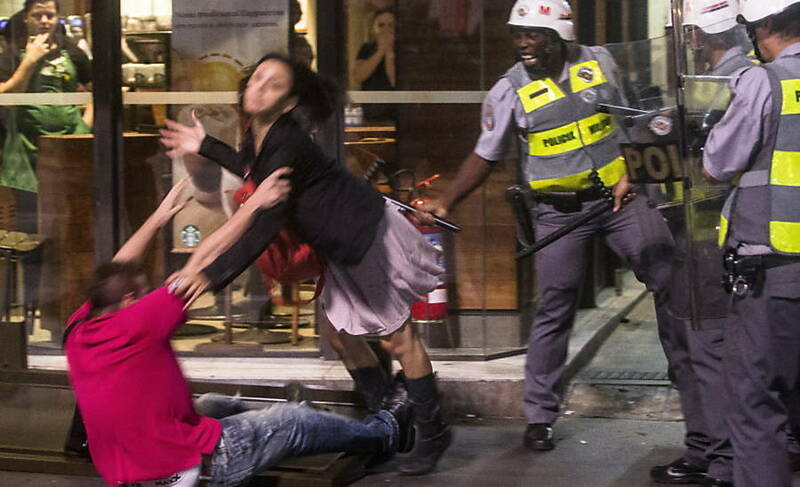 And, it’s also evident in this image, where a black police officer hits a white Brazilian woman with his baton, forcing her to fall into the arms of another light-skinned protester. These three images appeared again and again in domestic and international media coverage, as well as through social media platforms like Facebook and in YouTube videos that compiled images of police repression. Media coverage of participants in the June 2013 demonstrations in Brazil framed whites as legitimate protesters and representative members of the national body politic, and, particularly white women, as the wrongful victims of police repression. But how have black Brazilian protesters been represented within the movement and in media coverage? Is violence against them similarly understood as an illegitimate attack on the national body politic? In one Washington Post piece, for example, the contrast is startling. 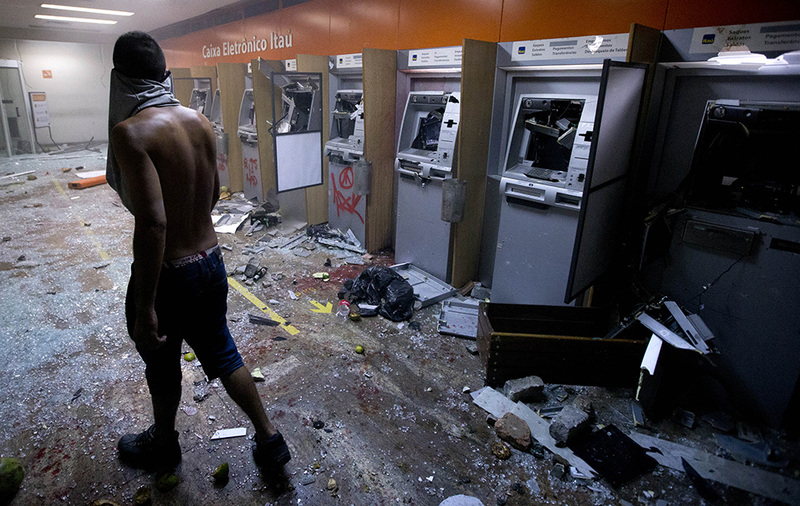 While it includes two photos of white women suffering the effects of tear gas and pepper spray, the two images of black men show one with an Anonymous mask in front of a burning barricade, and the other in front of a line of vandalized ATMs (photo above). While neither is actually engaged in an illegal act, the photographs’ compositions work to associate black youths, and indeed, blackness, with vandalism. These photos of black male protesters work to generate a very different type of indignation. While the photos of white female protesters produce a rallying cry against the external threat of police repression to the movement and its members, photos of black male protesters work to mark and chastise them as an internal threat to the movement’s success and future. These exclusionary discourses manifest themselves in racist practices with lethal consequences. 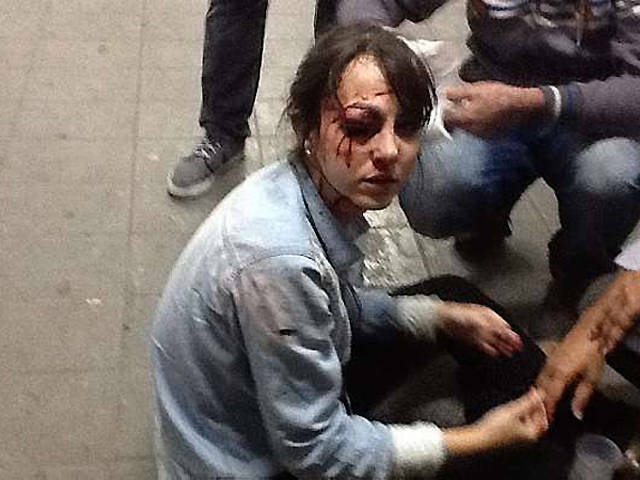 The police repression white middle-class Brazilian protesters have experienced over the last few weeks pales in comparison to the violent police brutality nonwhites experience everyday throughout Brazil. This differential treatment has not escaped the recent wave of protests. On June 24, military police action by the BOPE Special Forces (the inspiration for Elite Squad) in the favela community Nova Holanda, in the Complexo da Maré, left 9 residents dead. The deadly raid followed a peaceful demonstration in the neighboring area Bonsucesso. Troublingly, domestic coverage in the U.S. has highlighted that only two of the dead did not have criminal records. Media sources more generally have called them “gang members” and drug traffickers, unquestioningly accepting police claims, even though there remains great uncertainty regarding the reasoning for the police raid or its high death toll. In the meantime, and with the recent end of the Confederations Cup soccer tournament, it seems that much of the international media has already moved on. ~ Katherine Jensen is a PhD student in sociology at the University of Texas at Austin, currently living and doing research in Brazil.